the best product for their applications. 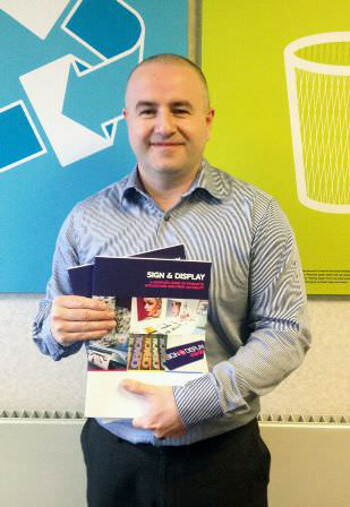 Michael Crook with new Antalis S and D brochureAntalis UK has launched a new 120-page guide to its full range of sign and display products. The brochure, which has been designed to help customers and printers in the selection of substrates for different applications, includes every product offering from PVC, large format papers, plotter vinyl’s and sundry items. It also includes visual representations of the possible applications for each substrate, an aid to help printers identify how each product can be printed, so that they can obtain the best results. Among the extensive range of products displayed in the guide are familiar brands including 3A, Drytac and Orafol as well as its pan-European Coala range of large format digital media. Commenting on the launch of the new Guide, Michael Crook, Sign & Display Product Manager said, "In a market where more and more printers are diversifying their capabilities and branching out in to large format production, this guide will be invaluable to those looking for help in selecting the best product for their applications." Michael continued, "We have worked hard to build a strong portfolio of sign and display products so customers can source everything they need, quickly and efficiently from one supplier. This Guide demonstrates exactly what we are trying to achieve and we hope that it will become the number one reference for anyone in the industry, whether they be small players new to this sector or established print experts. A full downloadable version of the brochure is available at www.Antalis.co.uk. A hard copy of the Guide can also be obtained by contacting your local Antalis sales office or by calling 0044 (0) 870 607 9014.